All PRESIDIO homes currently listed for sale in San Antonio as of 04/26/2019 are shown below. You can change the search criteria at any time by pressing the 'Change Search' button below. "This home offers 4 bedrooms and 4 full baths. Open floor plan with a study, living and dining room, family room and kitchen. Large cabinets and fixtures to add to appeal. Window Coverings, Stove and Refrigerator are included. Large patio - perfect for entertaining! This is a home you will enjoy adding to your list to view." "Beautiful 2 story in gated neighborhood located on greenbelt with a stunning view! Open floorpan, high ceilings, plantation shutters, and wood floors throughout. Large oversized master bedroom with spacious master bath. Great sized backyard with oversized patio and deck off of secondary story. 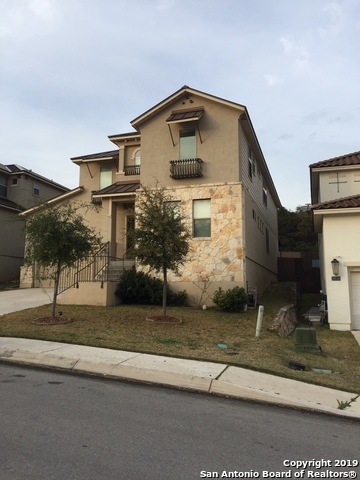 Easy access to 1604 and excellent NEISD schools." "This McMillin, Mediterranean home has been meticulously, well maintained by original owners. Beautiful, hardwood floors throughout the first floor. Includes an open floor plan with two living areas, two dining areas, study and a game room. Living room features a surround sound system. Each bedroom features a spacious walk in closet. Yard is well manicured with matures trees and covered patio slab/deck. Recent improvements include HVAC replacement, sprinkler system, reverse osmosis, granite count"